I made some phone calls today, and the medicine snafu turned out to be a FedEx problem - they came to deliver it, but no one was home and they didn't leave the package nor a note indicating they'd been there. They were called and instructed to, in the future, leave the package without a signature. I also arranged with the drug company to leave a message with the FedEd tracking number so I'd not only know that they'd shipped the medicine, but how to track it. I also called Children's and tried to clarify the procedural discrepancies with the injection. It turns out that the instructions we were given at Children's were exactly correct. We are not suposed to inject air into the vial before drawing the MTX into the syringe. This is now moot, of course, since we have the pre-filled syringes now. Also, we're not supposed to draw back after inserting the needle. It's just unnecessary for subcutaneous injections. The staff at Children's has carefully tuned the procedure to make it as simple and effective as possible. Julia's been complaining more about her sore calves. I'm hoping that this is just sore muscles and not a JDMS problem. The pain comes and goes, but it seems pretty severe when it happens. I want to thank everyone who told me that Julia's recent falls may be a symptom of her JDMS getting worse. I was already aware of that when I wrote it, and I was just documenting the falls in case it comes up in the future. I don't think these two falls were a problem. One was while she was playing a game with some of her friends on pavement, and she just fell and skinned her knee. The other fall, down a few stairs in our house, was because she was in stocking feet and not paying attention, and slipped on the carpeted steps. If this becomes a continuing trend, I'll contact the doctor. Today was the day we were supposed to use the pre-filled Methotrexate syringes. Note the "supposed to" in the previous sentence. It turned out to be a total disaster. We decided to give Julia her medication at 2:00, about half an hour before we had to be out the door to get to an appointment. My wife was going to do this injection. We carefully followed the procedure, Julia had the EMLA on for almost an hour when we removed it and cleaned the area. She took out the prepared syringe, inserted the needle in Julia's arm, and . . . nothing would come out. Pressing the plunger as hard as she could, and nothing would come out of the needle. I tried the press the plunger of the syringe, and more nothing. It was like the needle was blocked. I couldn't even budge that plunger with a pair of pliers. Well, we figured, no problem. We'll just try another syringe - they told us that this had happened once before with MTX. Second syringe, same problem. Panic time. The third and fourth syringes were also apparently blocked. Got on the phone to the drug company and the hospital, with the clock ticking and us at our wits end. The rheumatologist on call was not helpful, she just suggested using the vial of leftover MTX (and larger bore needle) that we had from last weekend. The drug company tried their best, even offering to have a courier deliver us a new shipment, but we had to leave in just a few minutes, so that was not a viable option. After struggling with the 4 syringes, I finally was able to get one of them working, but in the process, I lost some of the MTX. We still had that vial of MTX from last weekend, though. We gave her the rest of the one working syringe (injection # 2), and made up the deficit with the vial left over from last weekend (injection # 3). This latest was delivered with a 26 gauge needle, which is considerably larger than the 30 gauge needles we were supposed to use, and caused Julias considerable amount of discomfort. This whole incident was very upsetting to us all. We will need to straighten this all out next week. Again this weekend, Julia crashed about 2 hours after we administered the dose of Methotrexate. We recalled that she had a similar problem last year; we were giving her oral MTX first thing in the morning and a few hours later, she was crashing. To counteract this, we moved her dose to 4:00 PM each Saturday, which worked like a charm, until last weekend when we went to injectable. Apparently, the dose is effectively higher because the injectable is better absorbed. We decided that we will move the dose time again to about 7:00 PM, and hopefully even if she gets crashingly tired, she can just go to bed. Julia is so sensitive about everything, it seems, these days. It is very frustrating at times. I find myself becoming increasingly impatient with her, and I don't like that trend. She complains with the same level of stridency about almost anything that bothers her - a bump, a scrape on her elbow, getting her hair brushed, or not getting her way about something. She's been crying a lot lately. It's difficult to tolerate some days. We got the MTX syringe problem straightened out again. The will be delivering us a new shipment of syringes today with separate 30 gauge needles. We will simply have to attach the needles before doing the injection. The nurse at the hospital and the people at the drug company were extremely patient and cooperative with us. Julia came home early from school today with a stomach ache, then had several more bouts of diarrhea. This was very unpleasant for her (it was a very hot day, and she was already uncomfortable from that), and reminded us of what happened a month ago, but perhaps not as severe. We decided to give her some Pepto-Bismal in caplet form (she hates taking liquid medicines), and that seemed to help. We gave her some in the early evening, and again right at bedtime, and she slept well. Today was Julia's Field Day at school. The mini heat wave broke, and it was cool and cloudy today - about 35 degrees cooler than yesterday. Gotta love New England weather. Anyway, you can understand that she wanted to go to Field Day, and was motivated to take her medicine. More Pepto-Bismal in the morning, and she was fine all day. She actually felt a lot better by evening, so we didn't give her any more. At Field Day, Julia fell during the sack race and scaped up her knees. I've noticed she has had a few falls recently, and this is probably a sign that things are not going well with her muscles. Today, Julia had her keyboard recital. We took time off from work to go. There were 4 keyboard students, several flute players, and one saxophone player. These were all students at Julia's school taking lessons from a private instructor. By the time the recital started, most of the students in the school were there to watch. Julia's class did a group number, and then each student did a solo piece. It was nice, and Julia did very well. Today was Julia's annual dance recital. She, and all the dancers at her dance studio, did an exceptional job! This year's theme was "A Tribute to Broadway," with the dancers showing off their moves to music from shows like Annie, Grease, Godspell, The Sound of Music; well, you get the idea. The dancers did two shows, which I imagine is very tiring. They have to change outfits during the show. It was all very hectic, but the show went off beautifully. Julia's class did three numbers, the highlight of which was "Hey Big Spender" from Sweet Charity. It was the highlight of the whole show. After the dancing, they gave out awards. They give out trophies to everyone who has danced for 5 years, and Julia got her 5 year trophy this year. 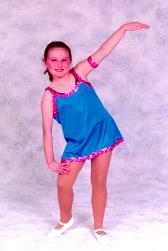 It's hard to believe she's been dancing for 5 years already! The instructor also gave out a special award for 6 or 7 of the dancers (out of over 100), who displayed "Outstanding Attitude and Dedication in the Art of Dance." Julia was one of the recipients!! We were so proud of her - neither we nor she expected her to get this award, and it really says a lot about her, to do so well despite having to deal with JDMS. It was a stunning, but joyous moment. Congratulations, Julia!! After the late show, Julia got home and we gave her the Methotrexate injection. It was late, already her bedtime, and she hadn't even showered yet, so we decided to give her the injection without the benefit of EMLA cream. It was that, or she would have been up for a long time past her bedtime, which wreaks havoc come Monday mornings. Well, the separate needles were not a problem, and Julia barely felt anything. We won't forego EMLA on a regular basis, but it's nice to know that we can skip it if the situation warrants it. This was a rare quiet and relaxed day for us. Julia and her mom went to a big rubber stamp show - they're both into it right now - and I went to a local car show. Neither of us would have had any fun at the others' activity, so it worked out well. Julia's been having more than a little muscle pain and stiffness in the past few days. We don't know what to do to properly exercise her so this doesn't become a problem. We decided to email our doctor and ask about getting Julia some physical therapy. Julia is not doing well these days. She definitely has some stiffness and lack of flexibility, as well as a noticable loss of strength. She can't take a gallon of milk out of the refrigerator and pour herself a glass. She has trouble putting on and taking off her pullover shirts. She can no longer do a sit-up, and she can't stand up from a sitting position on the floor without using her arms. We're also getting quite impatient with her moodiness these days. Every morning is a struggle to get ready for school, and sometimes it's more like a battle. She bursts into tears every time something she's doing doesn't come out perfect. She gets all worked up at the slightest provocation, and bedtime has turned into a daily exercise in frustration. She seems to complain about everything. We're feeling more than a little despair about this. Today was Julia's last day of school for the summer. She has been saying for weeks how much she's been looking forward to the end of school, but now that it's here, the first thing she said was that she missed school! Go figure! Today is World Juggling Day! I hope everyone gets out there and juggles today or tries to. Julia got her Methotrexate injection without incident today. Happy Father's Day! I want to wish every other father out there a wonderful day. We had a visit to Children's Hospital today that turned out to be...well, I'll get to that in a little while. We started off with getting the blood work done shortly after noon (hoping that they'd have some of the results before our appointment), and then we had an appointment at Physical Therapy. The PT visit was dual purpose - to evaluate Julia's status, and to give us some tools to use at home to keep her strength and flexibility up. After a snafu with the insurance paperwork, we had a 45 minute session wit Jen, a physical therapist. She asked about what limits Julia has, how long she's had trouble, what she does, and so forth. Next, she took flexibility measurements. She used a kind of protractor to measure the angle Julia could bend her ankles, knees, hips, elbows, and so on. She also tested how far her legs, ankles, arms, and wrists twist. She then tested her strength in her arms, wrists, elbows, shoulders, etc. She said that Julia has some loss of flexibility in her upper legs (hip flexors, hamstrings) and in her shoulders and neck. She said it wasn't serious, but was measurable. She gave us 4 simple exercises: a hamstring stretch, a hip flexor stretch, and a couple of shoulder stretches that use a stick or a towel. These exercises are not designed to help her loss of strength, only medication can do that due to the inflammation. The best thing was the patient instruction sheet that Jen gave us - she drew little stick figures that showed what each exercise was supposed to look like. This will be a lot easier to use that written instructions would be. We had a couple of hours to kill after PT, so we had a snack in the cafeteria, picked up a a prescription at the drug store, and browsed in the Museum of Science on-site store. We went up to the rheumatology clinic and checked in. We got Julia's measurements done quite early. Weight - 33.9kg./74.5lb., and Height - 50.5"/128cm. She hasn't gotten any taller, as expected, but she did gain about 3 pounds, that increased appetite showing itself. Blood Pressure - 122/57 and Temperature - 98.1°F/36.8°C, both normal. We finally got to an exam room and our regular nurse came by to talk to us because Julia's doctors were both still busy. She apologized profusely for the problems we had since our last visit with the MTX syringes - the pre-filled syringes are supposed to make things easier, not more troublesome. Apparently, she and Dr. A.W. separately got on the phone with the drug company and read them the riot act. The nurse interviewed us and got up to date on Julia's case and her current drug dose. After a while, Dr. A.W. came in and did her usual routine of talking to us and asking how everything is going. All three detailed the muscle problems Julia has been having in recent weeks. We also asked about canceling Julia out of basketball camp we have scheduled for next week. She then completed her usual clinical exam and strength tests. She also noted how well Julia's rash is looking. It is looking better. It's easy to forget those symptoms that have improved when others are bad. He's recommending 3 consecutive days of IV Solu-Medrol treatment. This is the same treatment she got back in April - 1000mg of IV steroids infused over a 3 hour period - admistered three days in a row. She will not need to take the oral prednisone while she's getting the infusions. We had the choice of doing it outpatient or admitting her. We decided to admit her. Julia will get an infusion tonight, another tomorrow, and another Thursday. Dr. S. said that typically after this treatment, JDMS patients feel great - he said that we could expect Julia to be able to fully participate in basketball camp next week! This is great news, if it happens. The accommodations at Children's for kids who are admitted are great. Every kid gets their own TV and VCR, and there's a library of tapes available for them to watch. Julia is going to love playing with the electric controls on her bed. There's a playroom/lounge for the kids, and a kitchen where food and snacks are kept. They did warn us that most of the kids on the floor she's on are Oncology (cancer) patients, so it may be upsetting and we should be ready for that. They have a cot in the room so that one parent can stay. Julia's mom will be staying the whole time. The nurses took an oral history on Julia and several medical students performed yet another clinical exam. A little while later, the floor rheumatologist came in and did another clinical exam. Julia has had her strength tested so many times today it's not even remotely funny. We were not even remotely prepared to admit Julia tonight. No clothes, no "friends" (stuffed animals), no toiletries. I took a list and made a run to get some of these necessities. It's an hour each way to Children's, so I was looking at almost 3 hours of driving and some time to pack stuff in between. Fun. Not. While I was gone, they got the catheter put in her arm. We started by putting EMLA on the backs of both of Julia's hands. It was all for naught, as they couldn't sink a needle in either one - they said her veins kept moving around under the needle. So, they put EMLA on her elbows (where we put the stuff on before she had blood drawn for lab tests) and had to wait an hour for that to take effect. I walked in after making the home run just after they finished putting the needle in. Julia was in some pain, and the worst of it was over at that point, but her lying on that hospital bed and crying just about broke my heart. I left after that - it was almost 11 PM by then, and everyong was exhausted. On my way out, I stopped at the nurses' station and they gave me the results of today's blood tests. A first - same day results! I got everything except the Aldolase, that always takes a while. As you can see below, these numbers are terrible - ther're as high or higher than they've ever been, even when she was first diagnosed and not taking any medicaiton. Right after I left, they started the Solu-Medrol infusion, and that wasn't done until after 2 AM. Julia slept through some of it, but not all of it. She will be tired tomorrow, she's been awake for almost 20 straight hours. Also, her Sedimemtation rate is 9, and her white blood count is 7.7. Day 2 of the hospital stay. Julia (and Mom) were both rather tired today, which is perfectly understandable after the night they had. I brought Julia a basket of flowers wih a Beanie Baby attached. She loved it. She spent most of today watching movies and hanging out in the play room. Julia has her left arm taped to a stiff board at the elbow to keep her from bending it because that's where they put the IV in. This is causing her some discomfort. She needs her hand and shoulder massaged regularly to relieve her discomfort. She was also getting relief by holding her hand over her head, or by holding on to my hand. I jury-rigged a handle for her to hold instead that actually worked better by tying a piece of Cat 5 ethernet cable into a loop and hanging it from the IV bottle holder that was attached to the ceiling. I got there in the late afternoon and she didn't seem to have had either a Physical Therapy session, nor a blood test that was supposed to happen in the morning. I asked around and it turns out that she actually did get a blood test - at 4:00 AM when everyone was alseep, and they took it through the IV. I asked the doctor what the tests were, ahe he said they were electrolyte levels: Sodium 106 (95-115 is normal), Potassium 4.11 (3-5.5), and Glucose 143 (< 120). The glucose is a bit high probably because Julia hadn't had enough to drink yesterday. We were pumping the fluids into her all day, and she drank almost a quart of fruit punch and water, plus she had an 8 fl.oz. chocolate milk with each meal. Dr. S., plus the floor rheumatologist, Dr. S.S., and one of the medical students who saw Julia yesterday, came by to see how she was doing. They only stayed for a couple of minutes. They had Julia walk down the hall and back, and they made some comment about her gait, but I didn't catch what they said. They also said that they scheduled today's Solu-Medrol infusion for 7:30 and tomorrow's for 3:30 so we can be discharged as early as possible. They seemed to think she was doing well under the circumstances. The really had forgotten to order a PT session. Amy from PT came down at about 4:00 - too late for Julia to use the whirlpool for today. She promised that Julia could have 2 sessions in the whirlpool tomorrow if she wanted, and they'd be scheduled so as not to conflict with either her meals or her infusion. She then went through the usual battery of strength and flexibility measurement tests, with the exception of tests that would have required Julia to bend her left elbow. Her infusion started a little before 7:30. Julia had a hard time getting comfortable; I think that was because she was so tired. A lot of it, though, was that her arm was so uncomfortable. She wanted to go to sleep during the infusion, but the arm was so stiff that she couldn't sleep until the infusion was done after 11:00. They finally got permission to give her a Tylenol tablet to ease the pain, and right after she took it, she did go to sleep. Next time, we're going to insist that she get the infusion in her hand and not in her arm. This arm thing has really been the worst part of it all. After a small breakfast, two PT techs came by to bring Julia to the whirlpool. They had Julia move her arms & legs in there. They suggested that we use our whirlpool at home in a similar way, and that swimming is a good exercise, too. They did say to avoid activities that are jarring to the joints. They also suggested that some of the falls that I documented earlier almost certainly were indicators that her muscles were having problems. The nurse said that Julia needs to drink more to avoid kidney problems that sometimes happen with Solu-Medrol. We will try very hard to get more fluids into her today. She got more blood drawn today. They had wanted to draw it from a new site, but her mom asked if we could just use the IV site instead, like they did yesterday. They hesitated because of the problems with the infusion last night, but that was caused by the arm stiffness, not the injection site. They did use the IV site, and it was not a problem at all. They did a complete workup - the usual tests we get done at her exams, plus the electrolytes workup we had yesterday. Dr A.W. came in, asked how it went. She also suggested that we can get Julia to talk to someone (psychologist). Julia doesn't really want to, and we're not going to push her on it, but she softened a bit after she heard about the benefits and had all her concerns about it addressed. Dr. A.W. also said that Dr. S. had pushed the Solu-Medrol infustion today to 2:30, so we can get out of there a little sooner. Cool. Julia's infusion went better than the last two, mostly because it wasn't started so late in the day. She actually took a half hour nap during the procedure. Toward the very end, though, the needle site was cauding her a lot of pain. A warm pack helped a bit, but she was pretty uncomfortable. Dr. S., Dr. A.W., Dr. S.S., and the med student came by to talk about things. After the infusion, we had to wait an hour to make sure there were no problems, then we could go home! Dr. S. explained that this is the treatment that they usually give new JDMS patients. We talked about this morning's lab test results; see below: some of the numbers are now in the normal range, the CK took a nosedive, and everything else is headed in the right direction. They usually expect to see a 50% reduction in CK levels after the three Solu-Medrol treatments, but we saw a 70% reduction after two treatments, which is very encouraging. We talked about how we're not starting off the same as a new diagnosis, so these results are better than we'd expect to see in that situation. We then talked about follow-up care. Dr. S. told us that we need to keep being aggressive, so we're going to do another Solu-Medrol infusion next week, preceded immediately by blood work so we can assess how we're doing. He said that if we tracked the CK level every day, we'd see it go down today and tomorrow because of the infusions, then start creeping up each day afterward. That's why we want to whack it again next week. We will probably do one every week for a while, until the lab results stabilize, then maybe once every 2 or 3 weeks. We were hoping that this trip would be it for a while. In fact, that's kind of what they led us to believe on Tuesday. I guess not. Julia was very happy and relieved to be home tonight. Julia was feeling better today. Nothing dramatic, but definitely noticable. She is still complaining that her arm hurts her. She had a needle in it for 48 hours, and it was taped to that stiff board forcing her elbow rigidly straight, so I imagine it'll take a while to feel better. Also in the not-so-great-timing department, my wife and I are going to be away all this weekend. We are part of the team that is presenting a Marriage Encounter weekend, and we won't see Julia until Monday morning. At least we have cellular phones. We've spent a lot of time preparing for this weekend, and we think it's very important that we be there, but it we certainly feel some regret and guilt at not being with her this weekend. Julia is okay with it, since she gets to be with her grandfather for the weekend, and we know she's in good hands. Julia had her Methotrexate injection this afternoon, a few hours earlier than usual to accomodate her sitters this weekend. They took her to her regular doctors' offices, and it went without incident. Reports on Julia indicate that she's doing great!! She's in excellent spirits and seems to have a lot more energy and strength than before. We finally have Julia back home, and what a wonderful, great day we had together!! Julia was truly in the best of spirits, just smiling and bubbly all day long. We went to see the new Disney movie Tarzan, went out to lunch, and had a generally nice, relaxed time. Julia definitely has more energy, and her mood all day long was positively ebullient. We haven't has a carefree, enjoyable day like this for a long time. Several months, at least. This was like finding somthing that had been lost for a long time, or finding the time to enjoy a favorite hobby after neglecting it for months. It was just so satisfying and joyful to experience her, the "old Julia," again. Julia has been doing her PT exercises every day. It's a real bear to get her to do them at bedtime, so we really have to make an effort to get her to do them earlier in the day. Today, she did them twice during the day and again in the evening. As the Therpist said, the more often she does them, the better it will be for her. Julia's outlook this week has been very heartening. Tonight at bedtime, she said "It's good to feel good again." Well said, Julia.